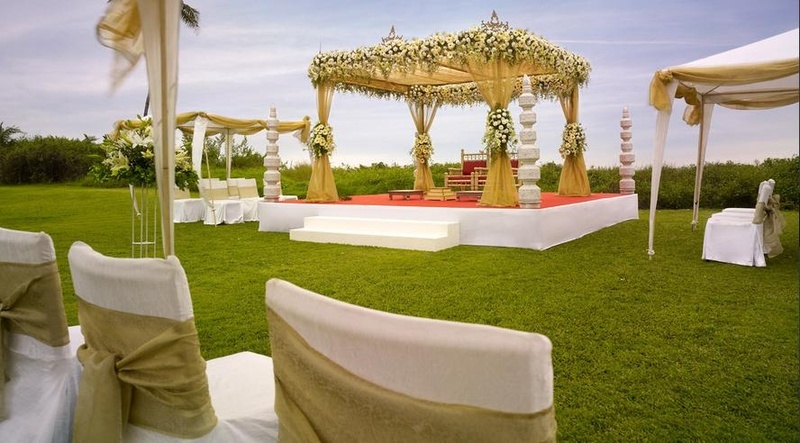 Visually Stunning Wedding Lawns in Delhi! Now that you have a stunning engagement ring on, it’s time to find an equally stunning wedding venue. A wedding in Delhi demands much fanfare and grandeur. With each wedding venue visually attractive than the other, finalizing one can be daunting. If you’re busy scouting for wedding lawns and not banquet halls for a change, we can’t be more delighted to share what we have in store this week for Delhi couples and those planning a destination wedding. If you’re planning for your winter wedding already, here are some of our favourite visually stunning wedding lawns in Delhi you must check out. Ritz at Ambience Golf Drive, one of the best banquet hall in NH 8 is where unprecedented value meets unmatched location. Offering 50,000 sq. ft. air-conditioned super structure, Ritz is one of the most sought-after wedding lawns in Delhi for celebrating luxurious weddings. Experience immense grandeurs through the in-house decor done by Ferns n Petals. If you’re hosting a mega wedding, this venue is truly your dream come true. The venue allows you to book your own caterer, DJ and liquor. Non-veg cuisines are not allowed. A luxurious boutique hotel that sits regally on 15 acre lush manicured greenery, The Umrao is perfect for lavish Indian weddings. The venue has multiple lawn areas with varying capacity each fit for small to large gathering celebration. As a full-service wedding lawn in Delhi, The Umrao provides all wedding services in-house, including food, decoration and entertainment. Though alcohol is provided in-house, the venue allows you to get outside liquor on the premises. A 5-star property, Four Points by Sheraton offers two best wedding lawns in Delhi. At this wedding location get everything you’re looking for with style and service. Their lawns come with attached indoor banqueting space giving you both a grand indoor and outdoor space to host an extravagant celebration. As a full-service wedding hotel, the venue’s expert events team handles all your wedding requirements. From tasty veg and non-veg meals to, breathtaking decoration to foot-tapping music, as well as alcohol, everything is managed by their internal staff ensuring your wedding celebration runs smooth. Offering a perfect fusion of style and comfort, we have the Sanskriti Green next on our list of the best wedding lawns in Delhi. Nestled in 5 acres of lush green space, this venue is a perfect embodiment of all qualities synonymous with 5-star hospitality. A preferred choice for high profile weddings, Sanskriti Green is one of the best banquet hall in Vasant Kunj and provides you full freedom of space allowing you to either avail the wedding concierge services of the venue or book your own caterer, decorator and DJ. Outside alcohol too is permitted on the premises. A superlative and extravagant wedding lawn in Delhi, Orana Hotels & Resorts is ideal for grand weddings and exclusive family gathering events. The venue’s impeccable detailing sets it apart from all other wedding lawns across Delhi. From The decor to choicest menu selections, from table settings to the flow of events everything is expertly managed by their in-house team. The venue allows you to book your own DJ and permits outside alcohol on the premises. Have a long guest list for your wedding and looking for a majestic wedding lawn in Delhi that can comfortably accommodate your requirements? Located in Chattarpur, Imperial at the Mallu Farm is your ideal match. Their in-house decoration provided by New Variety Decorators makes any event delightfully unique with exclusive designs. You can either avail the in-house catering services provided by the venue or make your own arrangements. This banquet hall in Chattarpur also allows you to book your own entertainment and arrange for your own liquor stock. A 70,000 sq. ft. of wide space, Pavilion at the Sharma Farms is one of the largest wedding lawns in Delhi perfect for a big fat Indian wedding. Throw a larger than life gala celebration at this wedding venue, where their expert decor team brings any wedding theme, vision and element to life. Just like Imperial at the Mallu Farms, Pavillion too allows you to either avail the venue’s services or make your own catering, DJ and alcohol arrangements. Check out more such stunning wedding lawns in Delhi here.